I hear you! Let’s get back on the road! I was planning for an early departure, but ended up rolling onto my phone after snoozing it. I slept until 8am! Gord took full advantage of this mistake by cooking me a protein-filled breakfast. Sadly, it was time to leave my wonderful hosts. They got me a nice sticker for Annie. 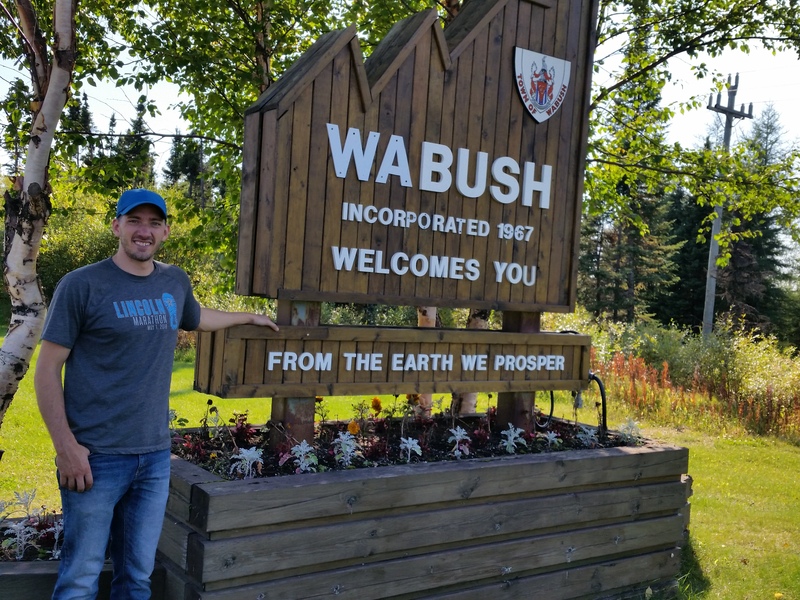 Thanks for the memories, Wabush! So what’s next? I was done with all of the song stops in Canada. However, there was one more unofficial stop that I felt I should make. Hank Snow, the original singer of the Americas version of “I’ve Been Everywhere”, was born and raised in Nova Scotia. There is a museum in his honor there. I was already leaning towards making the detour to see it, but a visit to their website sealed my decision. They were having a motorcycle “show and shine” in three days on the museum grounds. I thought that was too good to pass up. They only negative was that I would need to travel quickly to get there, causing me to once again bypass picking up my new rear tire. 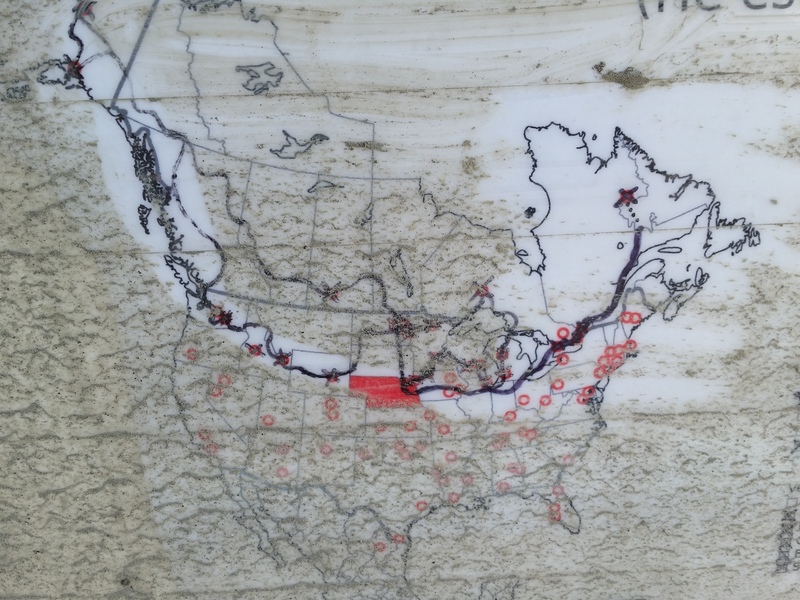 I estimated that the detour to Nova Scotia would add around 1,000 miles. Not ideal, but I thought I would make it. 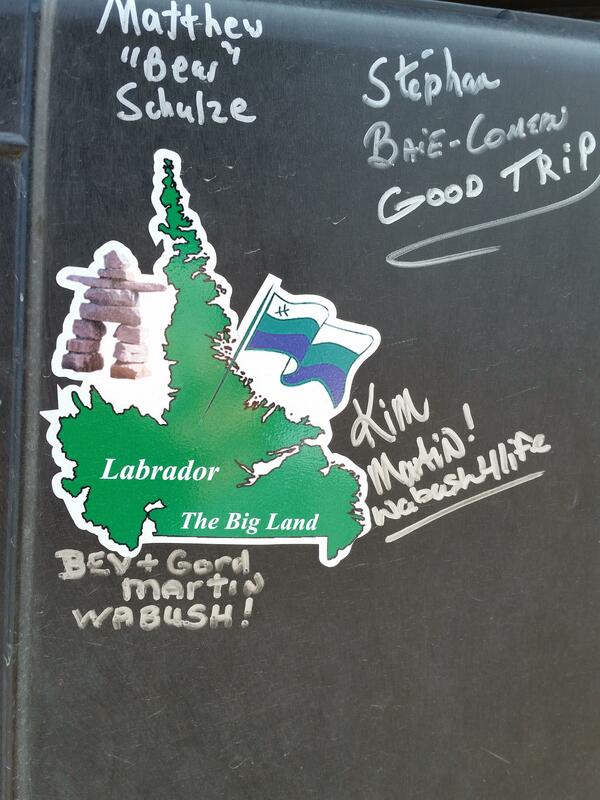 I can’t explain the feeling of continuing with Schefferville crossed off of my sign. Relief would be an understatement. Figuring out how to tackles that spot had weighed on me for years (no exaggeration), so being done with it felt amazing. The next portion of the trip should be very enjoyable: Mild climates, cellular data, no foreign languages, ample access to supplies. I’m looking forward to it. First, though, Rte. 389 was going to take another shot at me. Bring it! The top gravel section was better than on my trip up. It was holding the perfect amount of moisture. I probably averaged around 45 mph in this section. This time I was passing trucks instead of the opposite. I didn’t stop for a break until Relais-Gabriel. I could say that the gas was ridiculously expensive, but that would be unfair. What’s ridiculous is taking a motorcycle on this road. I’m just glad there are stations that allow me to fill up, especially in remote locations. Right as I reached the second section of gravel, it started to rain. I think the road was already so saturated that the rain had nowhere to go. It was a little sketchy. I met a road grater, which normally would be a welcome meeting. He’s improving the road, non? Unfortunately he left a linear dirt mound so large that I could not safely go over it. 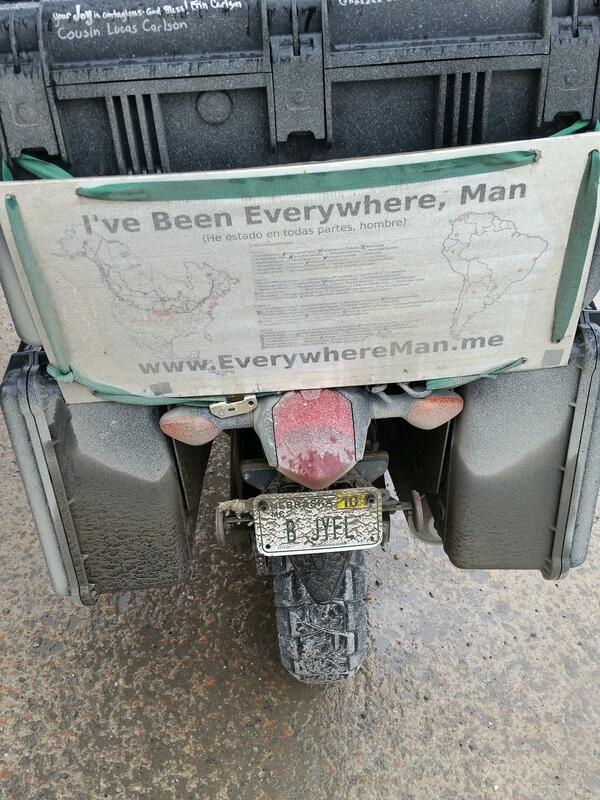 I was essentially boxed in to the muddy edge of the road. I just went really slow, riding with a foot or two down. I still didn’t quite figure out how to photograph the thing. 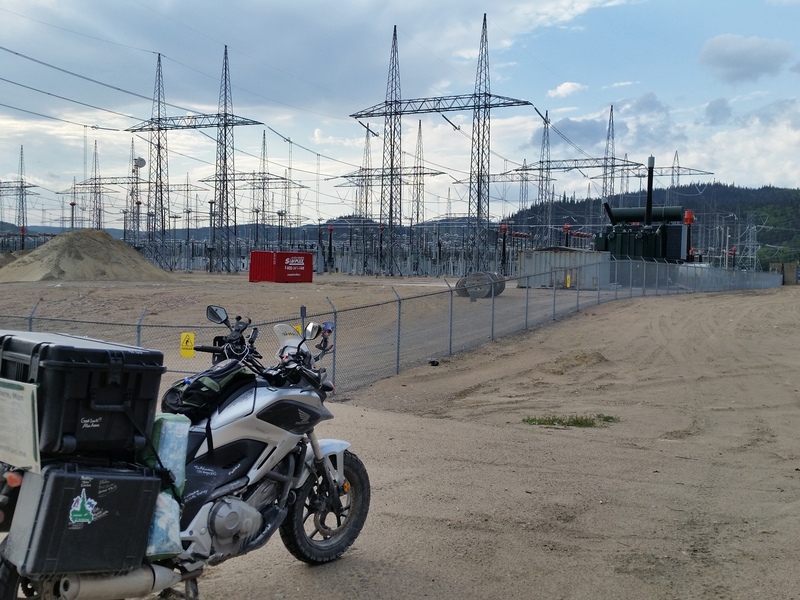 One of the power relay stations. The skies cleared and the bottom section was a delight once again. I’m glad I got to ride that stretch twice. With daylight waning, I decided to try to reach Forestville, where I had camped a few nights prior. The spot was not ideal, but knowing it was there allowed me to be more liberal with my use of daylight. I could ride right up to sunset. The spot looked the exact same as I had left it and I set up in a similar spot, though slightly flatter this time. I got a bright and early (or at least the latter) start, knowing I had a lot to get done in the morning. My plan was to take a ferry from Forestville across the St. Lawrence to save some time (yay) and some tire tread (YAY!). The ferry was set to leave at 9:45, but I wanted to be there an hour early since I did not have a reservation. Most cities along this region of the St. Lawrence have a ferry service. They have potential to save lots of time and mileage. Getting a ferry would save me about 300 miles. I figured that was worth the estimated $60 it would cost for Annie and me. I stopped into a McDonald’s for breakfast, resolved that I was going to order completely in French. As I began to address the cashier, two other workers stopped what they were doing to listen intently and help with my pronunciations. Once I finished slogging through the cashier asked in perfect English, “Is that for here or to go?” We all had a good laugh. They appreciated that I was trying. I worked furiously for a couple of hours, but not fast enough. I didn’t quite finish the post I was hoping to complete. The ferry was too important. While I was working someone had cleaned off my sign to see where I’d been. They forgot Ombabika! I arrived at the dock more than an hour ahead of time, which did not seem like a waste. Catching this boat was important. There was no activity around, which bothered me a little. I used the time to do a few maintenance things to Annie. Around 9am I took a brief stroll up a nature trail that was connected to the parking lot. I returned to find a car parked behind Annie. A gentleman was reading the sign. We began to talk (his English was very good) and he told me he did not think the ferry was running today. He asked me to wait while he left, presumably to go home, to pick up his copy of the schedule. When he returned, I saw my error. The ferry was running tomorrow but not today. Though I was a bit perturbed by my mistake, I was blown away by this guy’s kindness. His help saved me at least an hour. He thought there might be a noon ferry at the next town to the West, Les Escoumins. I thanked him and saddled up. That ferry was not running until 5pm, but at least I got a good picture. I tried once more at the next town, before deciding I was just going to have to go around, all the way through Quebec City. The miles didn’t bother me personally, but I kept thinking about the sparse amount of tread left on my rear tire. However, there are definitely less scenic rides to make. I was able to enjoy myself. 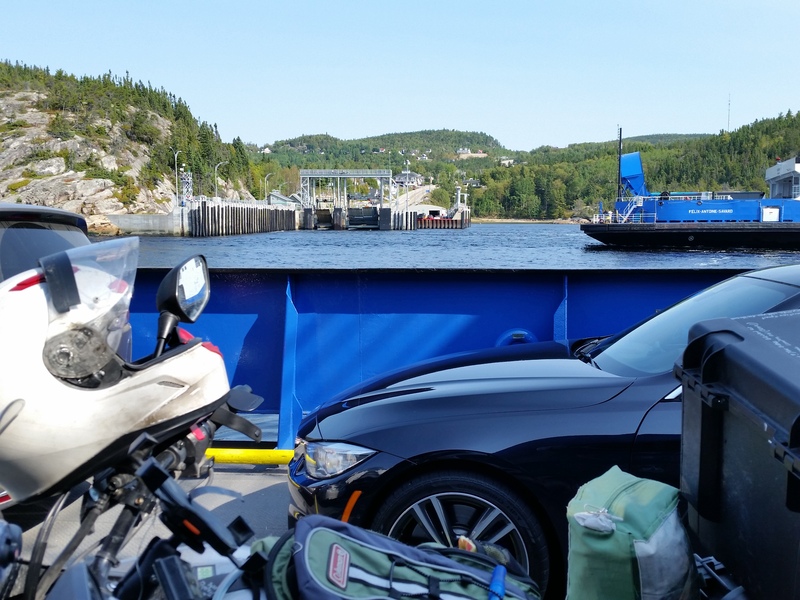 I timed the ferry over the Saguenay River almost perfectly, waiting for less than a minute before being ushered aboard. 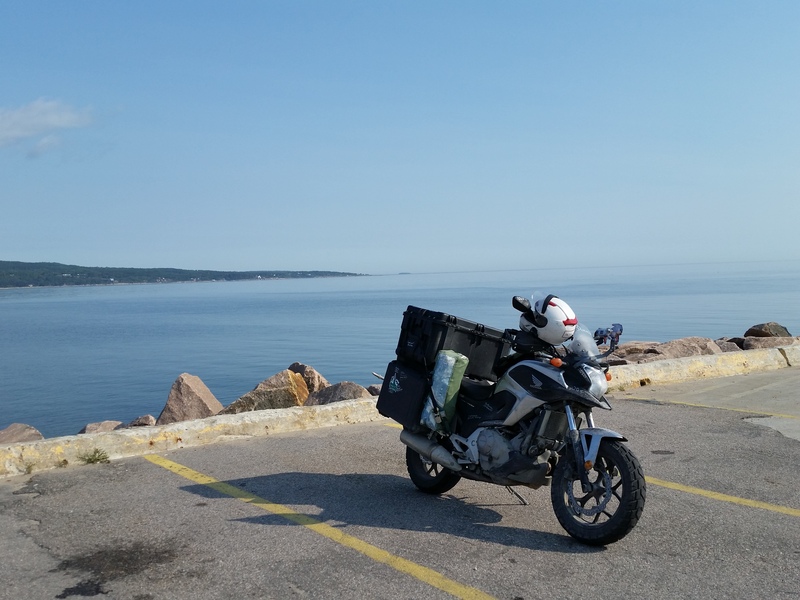 After spending the bulk of the day riding away from my destination, I finally crossed the St. Lawrence and began heading east at 3:05pm. It was quite a detour. I set a goal of getting into New Brunswick for the evening. I had a good experience with the province and people of Quebec. Unfairly or not, they do have a reputation among English speaking Canadians for being a bit less welcoming than other places in the country. On this trip, however, I can’t say that I experienced that at all. There were numerous Quebecois who were ready and willing to assist me, even before they heard my feeble attempts at using their language. So au revoir, Quebec. I hope your economy improves so that you can afford some English letters on your signs! Realtime update: Still in Maine. I think I might be a few more days here. I’d like to get caught up before I forget everything. In some ways, I hope to do some posts like this. Ones that cover multiple days and are less dramatic. 🙂 The Schefferville story took a lot out of me! As always, thanks for reading! Oh man, I totally forgot to mention this. 0/2 I guess.